For decades, UC Berkeley’s student government (ASUC) remained a frat-tastic refuge for the future autocrats of a once-golden state. We now stand at the dawn of a new era! This new era demands that new blood course through the clogged arteries of Berkeley student government. There remain significant obstacles in the path toward fully privatizing the UC: all of the challenges that cannot be resolved by the swing of a baton or the shock of a taser require heroic leaders brave enough to implement policies that go against the interests of most of those enrolled or working at UC Berkeley. 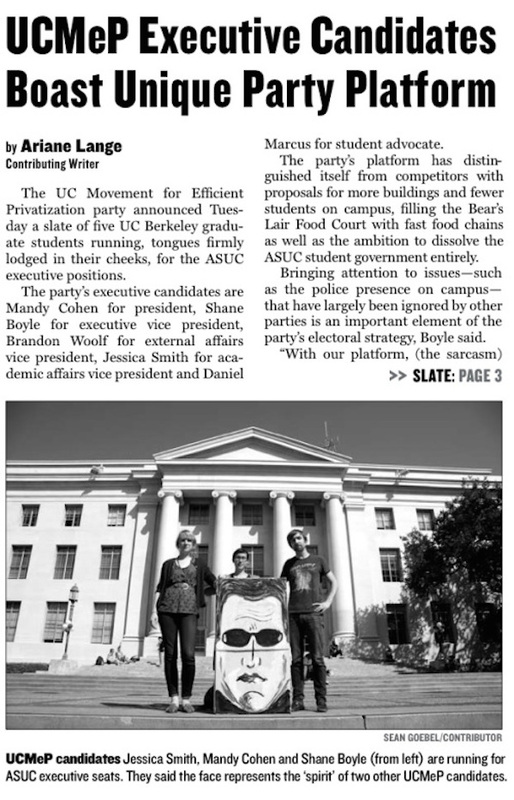 In March 2010, UCMeP proudly announced its decision to run for every single office offered by ASUC. UCMeP’s campaign was guided by the bold, forward-looking slogan: “Demand Nothing, Privatize Everything!” We assembled a formidable slate of candidates who insistently towed the party line set by the UC Board of Regents, while also refusing to waste time by participating in substantive debate. With less than a third of students even bothering to vote in student government elections, ASUC is far from a democratically elected body. But like any paper tiger worthy of the name, ASUC maintains an aura of authority that administrators never hesitate pointing to when arguing that there are legitimate channels on campus for students to lodge their concerns. Our slate of uniquely impressive candidates promised to capitalize on the Ponzi-scheme that is ASUC and to work tirelessly to push through our most-modest proposals.